It has now been about a month since I returned to India, after a rather long visit to Australia. When I got on the flight to Mumbai I was feeling really excited about coming back home. It even surprised me when I started calling Mumbai home, but for now, that is exactly what it is for me. Since I got back life has been crazy, but all in a good way. 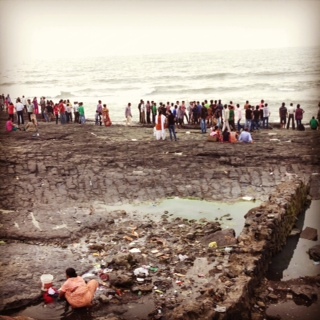 The chaos and dynamic lifestyle is one of the reasons I longed to return to Mumbai. On the home-front, I found myself a new apartment, hunted down furniture from all sorts of expats who were leaving Mumbai and got ready to move out of my friends house, where I had been staying. The biggest challenge was trying to work out how to get all the furniture I had bought and my stuff to my new apartment. Whilst there are plenty of tempos (or vans) available for rent, trying to negotiate with the driver and ensure I have someone trustworthy is challenging to do, both because of language and my Australian accent, and secondly because I don’t know any tempo drivers personally in my area. This is one of the few times I feel that having a man in my life would be particularly handy. Thankfully I have kind friends who are happy to share their husbands for this purpose. So my friend spoke to a tempo driver he knew, negotiated a price with them and spoke to them firmly about making sure they look after me and my things. Apart from turning up an hour late, they were just fantastic. Four guys turned up (the driver and three removalists) and we travelled to 6 different parts of Bombay collecting furniture and household effects for me. When I told another friend what my plan for the day was, he estimated it would take 12 hours, but we did it in 6! They were just great, and well earned their bonus. So I am now settled into my new apartment. It is really comfortable and already feels like home which is just great. As a freelancer, I work from home as well, so having a comfortable place to live is really important to me. Whilst I don’t have a specific job in Mumbai, I do a range of different things to earn a living. I find it interesting and challenging, and it definitely keeps me on my toes. Currently I am working on a few consulting jobs in the travel industry, one is helping a start-up and another is working on marketing for a rural home stay. I also continue to work as a travel writer for several different publications, and recently did a course on writing in Australia. On the business front, Potluck Me did its third delivery last weekend, I am getting closer to launching a very exciting new business with two business partners here in Bombay, and a third working with a friend in Australia. I also looked at entering another content based business arrangement recently but that opportunity unfortunately fell through, I will write more about that in a later post. On top of that I am still putting together a proposal for my autobiography, and have started researching a second biographical memoir as well. Needless to say, life in Bombay is certainly never boring for me. I have so many balls in the air, I just hope I manage to catch them all! But I am loving it, creativity and the freedom to try new things is what brought me back home, and what I see keeping me here for now. So many things to do in your life right now. I feel like dull person in comparison. If you do write an autobiography, count me in as a reader.